During Israel’s lengthy 2014 assault on Gaza, voices worldwide rose in stunned protest. Using numerous creative means, Palestinians and their allies bore witness to the Israeli attacks—and to the siege that has strangled Gaza ever since. 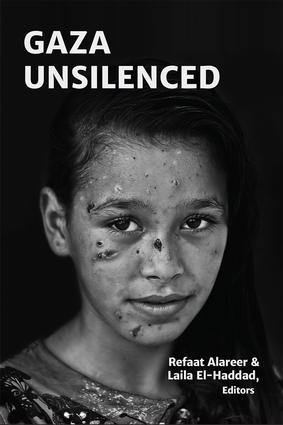 Gaza Unsilenced foregrounds the words and images with which Gaza Palestinians recorded the pain, losses, and dislocations of the attacks, the continuing punishment of the siege, and their community’s resilience and dignity. The book includes original contributions from the editors themselves along with essays, reportage, images, and poetry from Gaza and elsewhere. Contributors include: Ali Abunimah, Ramzi Baroud, Diana Buttu, Belal Dabour, Chris Hedges, Rashid Khalidi, and Eman Mohammed. Refaat Alareer is co-editor of Gaza Unsilenced (2015) and the editor of Gaza Writes Back (2014). A native of Gaza City, he received his M.A. in Comparative Literature from the University College of London (UK). Since 2007, he has taught world literature and creative writing at the Islamic University of Gaza. Laila El-Haddad is co-editor of Gaza Unsilenced (2015), co-author of the award-winning ethnographic cookbook The Gaza Kitchen: A Palestinian Culinary Journey (2013), and the author of Gaza Mom (2010). She is a talented writer, analyst, and social activist, and a policy advisor for Al-Shabaka, the Palestinian Policy Network.Born in Gaza, El-Haddad currently lives in Columbia, Maryland.